℗ 2013 Blue Griffin Recording, Inc.
"For all who have known love, only to have it go away for whatever reason, GREEN SNEAKERS should be required listening during a quiet and private time." "I am moved beyond words… it so intensely personal and honest, and deeply mirrors experiences and feelings in my own life… I’m still shaking a bit while writing this. What a beautiful and moving work, thank you." "This ripped me apart. Beautiful. Tragic"
"we were touched, moved, and disturbed. Suffering, so clearly expressed, is certainly beautiful, but also truly heartbreaking..."
Gordon Creates Masterpiece With "Green Sneakers"
It lasts only an hour and when it’s over you don’t know what’s hit you. 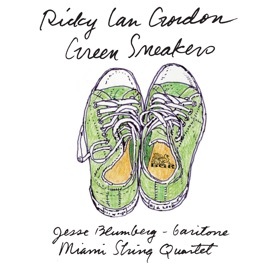 You know only that in “Green Sneakers” Ricky Ian Gordon has shared with you an experience of profound sadness and intensely personal emotion. Subtitled “for Baritone, String Quartet and Empty Chair” and premiered by Colorado’s Vail Valley Music Festival on July 15, the work so moved the audience in Beaver Creek’s Vilar Performing Arts Center that silence prevailed before applause led to a standing ovation. A monodrama in the wake of “Pierrot Lunaire” or a mini-opera, “Sneakers” affirms Gordon’s position as one of today’s most original voices in music theater. Here, however, the objectifying cloak of myth is absent, and Gordon faces Death head-on. The immediacy of the first person makes the narrative overwhelming. And it amazes that this is his first work for string quartet, for in an idiom that goes to the edge of atonality Gordon has created a microcosm of pain and despair that has all the markings of a contemporary Gesamtkunstwerk. Praised for his Monteverdi and Bach, Blumberg made this story his own, singing with a richly nuanced voice and - at 28 - the stage presence of a veteran actor. In the most wrenching moment of “Sneakers“ Blumberg went to the piano and played a brief phrase before turning to the Epilogue of Gordon’s libretto. Photos projected on either side of the stage add little to the music, for they speak of a reality that Gordon has left far behind in writing a work that pleads to be programmed throughout the country. The title, by the way, refers to footware bought for Grossi during his illness. Gordon wrote these poems upon seeing them in a closet after his partner‘s death..